By popular demand Kate is embarking once more, on her hugely popular and joyful Christmas Tour. You will be treated to an un-missable evening featuring songs from her highly acclaimed two Christmas albums. Kate is touring this festive season, as ever, with her superb band of multi talented musicians; Damien O'Kane on guitar, tenor guitar and banjo, Duncan Lyall on double bass, Aaron Jones on guitar and bouzouki and Nick Cooke on melodeon. As in previous years, the show will feature the magical and heart warming sound of a top-flight brass quintet. Steeped in her local traditions, Kate showcases the carols and songs learnt through childhood in her native South Yorkshire. Come along to hear new variations of familiar carols mostly unheard outside the area together with a selection of much loved favourites from her 20 year back catalogue together with one or two tracks from her brand new album “Ghost”. 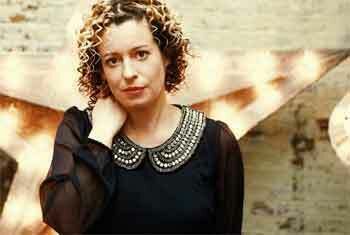 The defining voice of contemporary English folk music, Kate Rusby’s exquisite interpretations of traditional songs and finely wrought self-penned tunes have won her an audience that reaches beyond the genre. A rare achievement for a folk artist but entirely understandable given Rusby’s expressive vocals that invest whatever she sings with irresistible emotional depth. Kate has just been awarded a Gold Badge Award from BASCA, sponsored by the Musicians Union, for her song writing in recognition of services to the industry.